One of the most critical factors that one needs to keep in mind while shopping for a gun safe is the weight. Most of the time, individuals get carried away with the more funky features made available to the customers in the finished products from the manufacturer itself. All the while they don’t take into account the added weight of the extensive hardware that goes into the product package such as the circuitry and the wire harness. On the other hand, there is a section of people that opt for a safe that is either too lightweight or lacking the minimum amount of defense necessary for warding off unauthorized access to the contents of the safe. The weight factor of a gun safe depends on the quality of the materials used for manufacturing the same. Taking the example of a wooden cabinet, it would weigh less than that of a similar sized gun case made from reinforced steel. To safe keep your guns from the hands of a person with ill motives and also from the hands of your kids, it is crucial that the safe is manufactured from steel that is low in gauge. Keep this in mind, the lower the gauge, the stronger the steel is, all the while you’d be paying more for all that added strength. A small wall mounted or attached safe made from 12 gauge steel can easily weigh more than hundreds of pounds making it apparently impossible for any person to simply carry the safe away or break into the same. The type of firearm that you possess and want to safe keep determines the type of safe you’d be opting for. Now, opting for a safe for carrying your firearm while being on the move that weighs 100 pounds is impractical. On the other hand, a gun safe for securely storing assault rifles shouldn’t weigh less than 500 pounds. If you are willing to invest more on a safe that ranges in the 500 – 800-pound range for your assault rifles, then the resulting safe would provide you with ample support and safety factor when compared to that of the cheaper alternatives. The recommended safe weight suitable for portability factor is anything that falls within the range of 50 – 10 pounds. A concealed, safely mounted in the compartment made in the wall of your home should be a minimum of 25 pounds. A gun owner who has a considerable amount of guns in his collection would usually settle for a safe that weighs more than 500 pounds. Now, why go for a super heavy safe when you can do with the heavier, affordable versions of the same? The following points would help you draw a clearer picture to the above question. The heavier the safe, the more the capacity a safe can offer the user to store their armory. Even if you are new in the hobby of collecting antique guns or already own a substantial stockpile of both advanced and expensive weapons, the weight factor should be the first priority. This is also the driving force that advertises the fact of available space offered by the safe. Buying a safe with large capacity allows the user to save money in the long term as it makes sure that you don’t need to spend money on another safe when you run out of space in the existing one. 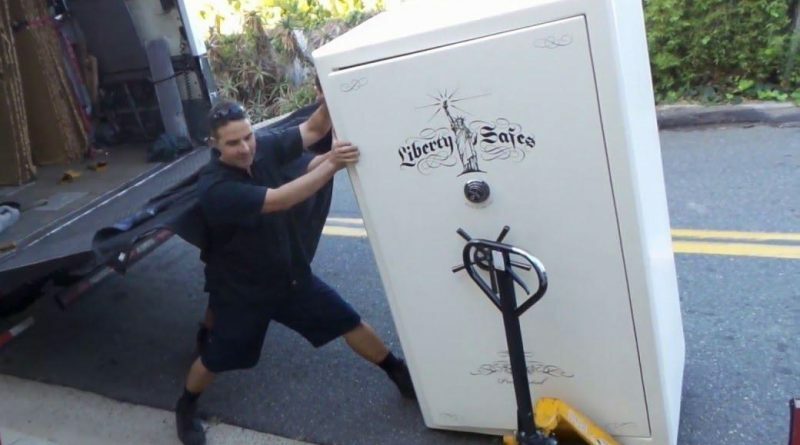 Safes that weigh more than 500 pounds are made from 12 gauge steel. This specification allows the user to enjoy the security factor on offer by the safe which is beneficial for increased protection for your collection of guns. This increases the protection factor of the safe in case of a break-in. high-end safes are incorporated with several protective features such as hidden hinges and bolt mechanisms. These added features act as secondary lines of defense against forced access to the contents inside the gun safe. A gun safe that lightweight, not only has weak structural integrity but is also easier enough for an individual or a group of individuals to go about on their merry way with the whole safe in their hands. A heavy safe, on the other hand, gives you, the owner, the advantage of the safe’s immovability once the same is bolted down on the floor. This makes stealing the whole setup virtually, theoretically and practically impossible by the thieves. Since heavy gun safes are loaded with benefits, one should also know the disadvantages of the same that comes as an accessory to the benefits. This is essential if you want to make a more informed and effective buy, take heed of the following factors. The cost is the main factor that often rings an alarm bell in the minds of a prospective buyer. The more the weight, the more advanced hardware is incorporated within the safe. This results in the added cost of production from the manufacturer’s side. This increases the overall cost of the safe and results in the scenario where you end up paying more for what you have thought you would. One should always keep in mind that heavy weight safes from elite brands would cost more, due to the brand value associated with the product. If the weight of the safe is too much, then it can cause substantial damage to your property such as your stairs or the floor of your household. If you plan to take your safe to the basement and set it up there, making sure that your stairs will hold up its integrity and won’t give way under the combined weight of the safe and the men carrying the same. Incidents like stairs cracking up and giving in to the weight of the stairs have been reported in the recent days. The weight of a gun safe is a critical factor that one should always pay a close attention to. The tips shared in the preceding section should provide ample guidance to anyone who is thinking to opt for a gun safe with features and weight factor, as per their requirements.